What do you do when everyone in the world is your customer? This is precisely the challenge Google aims to solve every day. They think a lot about customer experience but at times it might be called “user experience” because every person that uses Google is a customer—even though they might not be a paid customer. It wasn’t until I met Darren Pleasance, Managing Director of Global Customer Acquisitions, at Google and saw him keynote the SOCAP annual conference that I was aware of this customer experience team inside Google. What you might not realize about customer experience at Google is what a large focus growing small and medium sized businesses is for the company. Technology has become the great equalizer. No matter your size you can now compete on the world’s scale. Technology now hides complexity—products are more user friendly. Non-technical business owners can build detailed websites and mobile experiences just like any coder would. For example when was the last time you did not go to YouTube first in an effort to find a tutorial online? Google has improved consumers lives in many ways. 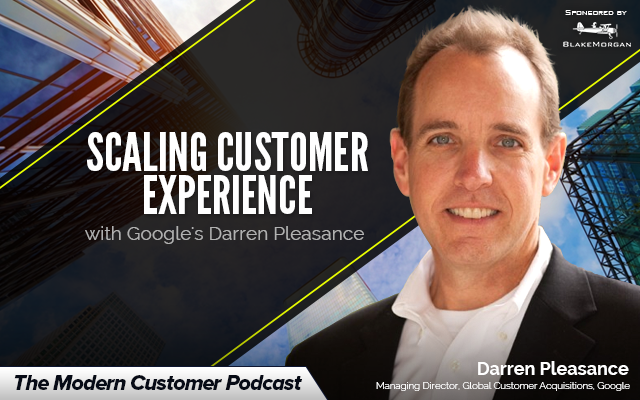 In this episode of The Modern Customer Podcast Darren Pleasance and I explore how Google views customer experience.